.... You can't catch me.... I'm the Gingerbread Man. OK. 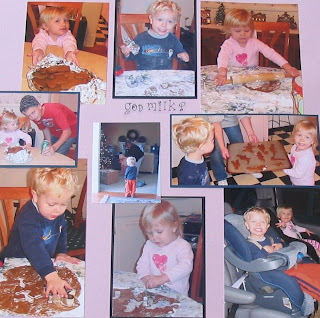 So I've always baked Gingerbread cookies with my children, every Christmas for years & years. Then, suddenly, they were too old and too busy. So I borrowed children. Almost rented them. "Help me!" I begged, "Help me make my Gingerbread men for Christmas." & they would usually help. This year, I got my 3 year old grandbaby to help, so it was cool. My sister in law requested these cookies for Christmas at her house this year. Beat butter & sugar @ medium speed til fluffy. In a separate bowl, stir together 1/4 c water and soda til dissolved. Stir in molasses. In a separate bowl, combine flour & next 4 ingredients. Add the flour mixture to the butter mixture alternately with molasses mixture, beginning & ending with flour. Shape into a ball. Cover, chill for 1 hr. Roll out, SHAPE with Cookie Cutters and cook on wax paper on pan. 350 degrees 12-15 minutes. Cool, then decorate. Aren't you suspose to cut the cookies out after you roll out the dough? According to your directions you bake the dough after rolling - it must make one huge cookie. Heather's friends are coming over tomorrow night and they are going to make gingerbread men, using your recipe!!! OK, Jim, I took your editorial advice to heart and altered my post. Happy? Fern - You guys will love them, they are so good! Wish I was there! Who is the cute little boy in the reader submitted photo of the day? The cute little boy? Hmmm.. could it be.... Cousin David in another family photo shoot?